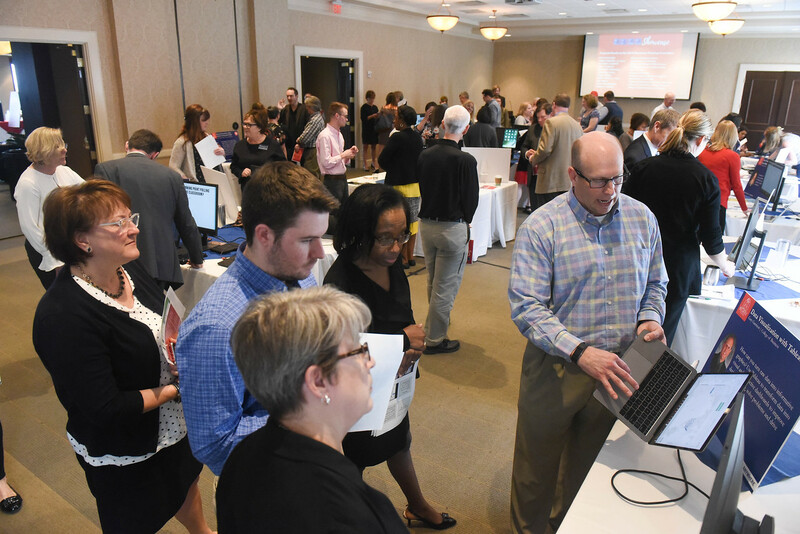 Belmont University’s Office of Instructional Technology recently hosted its first BYTE “Bring Your Own Technology Experience” Showcase where 22 faculty members from across campus shared ways in which they utilize technology throughout their classroom. Set up in the Frist Lecture Hall, the event included hundreds of attendees who walked from booth to booth for each demonstration. Featuring topics with both instructional and technological focuses, faculty members shared knowledge related to content delivery, grading, distance learning, data analysis, specialized software, web conferencing and more. Professor of Media Studies and Showcase Presenter Dr. Sybril Brown demonstrated “Holograms: A Virtual Representation of Knowledge.” To best illustrate the concept, Brown brought Hunter Morgan, one of her students, along with her. Morgan developed videos, that with the aid of a plastic viewer, turned a person or object into a hologram projection that came to life. Morgan and his team used these holograms to present their group project in class for an assignment based around an emerging piece of technology. Morgan holds his hologram, projected from a video on his phone, in his hands. Director of Instructional Technology and BYTE Showcase Host Geoff Price supports faculty in their use of technology with an explicit focus on aligning the capability of digital tools with research-supported learning strategies. He also provides professional development opportunities across campus that allow faculty to develop knowledge and skills for effective technology integration.